Directed by Lucian Muntean and Natasa Stankovic. 2007. 52 minutes. Study areas: Nepal, Child Labor, Human Rights and Tourism. 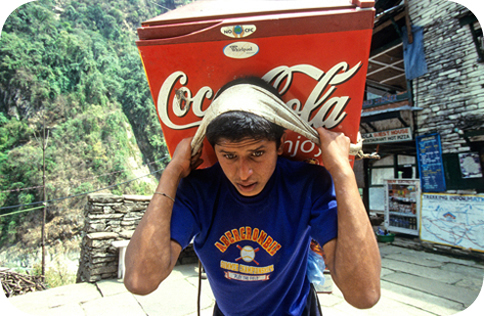 In Journey of a Red Fridge, we are introduced to the plight of child porters in Nepal. This type of child laborer is extremely common, yet working as a porter is considered to be one of the worst types of work; the average load weighs over 100 lbs. and carrying such heavy loads over a prolonged period of time often leads to health issues. According to the movie, there are 60,000 child porters in Nepal with only 25 percent in school. The film provides an intimate view and raises many interesting questions about child labor, but does not offer answers about how to eradicate it. The film starts with Hari, a 17-year-old Nepali porter, as he carries a refrigerator on a four-day trip from village to city for repairs. Along the way, Hari interacts with other child porters and talks about his experiences. We also meet his father and grandfather and observe Hari’s interactions with them. It appears that child labor has not harmed Hari, who has a cheerful and optimistic demeanor. He is an ambitious and altruistic protagonist who believes that hard work pays off. His labor allows him to pay for his college expenses. Hari started working as a porter at age 14, after his mother died when he was 12. For his work, he earns 300 to 500 rupees per day (equivalent to $4 to $7 per day). International tourists travel to Nepal and hire porters to carry their loads up and down the mountains, and the only source of income in the community appears to be tourism. Hari has decided that the best way to reach his goals of being the richest person in his village and bringing a hospital to his village is to study tourism. The movie explores the relationship between the porters and the tourists in an insightful way, and raises an important question: what are the implications when a community is dependent on the whims of international tourists? Another question raised here is the role that parents play in child labor. We see Hari interacting with his father. Several times, the father requests money from Hari, who loves his father and wants to meet his needs. The father appears to live in a nice house with a tile floor, a color television, and well-dressed family members. We don’t know much about the father’s economic situation—does he own this nice house? Does he live with Hari’s siblings? Is he exploiting his son? It is easy to understand why the filmmakers chose to tell Hari’s story rather than the stories of the girls who were carrying hay. The shots of the boy carrying a bright red refrigerator with the “Coca Cola” logo across fields with the Himalayas in the background are striking and beautiful, and Hari is an appealing personality. However, the many stories of the children who are harmed by child labor because they cannot attend school remain untold. This film would be especially appropriate for a high school global studies class. With a proper introduction, students can learn about child labor and discuss the implications for human rights. The pace of the film is slow, and the dialogue is subtitled. Therefore, children younger than juniors or seniors in high school might find it difficult to pay attention. Young adult viewers will likely be struck by the physical labor that is expended by the porters. They can try to imagine what it would be like to carry a load weighing 200 pounds for several days up and down mountains. The film could be used a starting point for students to explore such questions as what are the causes of child labor? What steps have policymakers taken to try to eradicate it? Should all child labor be banned, or do children experience some benefits from it? How does the nature of child labor differ for boys and for girls? The International Labour Organization (ILO) has a wealth of information about child labor on its website. Click here to learn more about child labor in Nepal at this ILO site. Mary Arends-Kuenning is associate professor of Agricultural and Consumer Economics at the University of Illinois. Her work on child labor and children’s schooling appeared in the top journals in population studies and economic development and is often discussed in United Nations and World Bank publications. She has worked as a consultant for the World Bank, the Inter-American Development Bank, the International Food Policy Research Institute, and the Population Council.